How to Invest in Direct Mutual Funds Plans? Home » Mutual Funds » How to Invest in Direct Mutual Funds Plans? 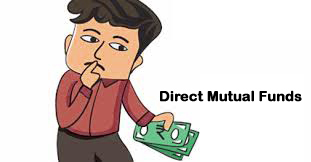 What is Direct Mutual Funds Plan? How to Invest in Direct Mutual Funds? If this question is bugging you here is the answer. Once you have decided to invest in mutual funds you have two ways of making Investment (1) Invest via distributor or advisor (2) Invest in Direct Mutual Funds. It is generally observed that Investor opt for the first option and go ahead with the distributor, however, it is advisable to opt for direct mutual funds. Here are some pointers in this direction. In this investment option, distributor or advisor will provide you assistance in the selection of mutual funds and earn commission or fees. Direct Mutual Funds schemes allow you to purchase mutual funds directly from the fund house. No intermediator or distributor comes into the picture. i.e. Investments under this scheme is not routed through a distributor and you can save commission or fees. Why Direct Plans are cheaper? Direct Plans are cheaper than the Regular Plans. No distribution fees, a commission shall be charged on the direct plan hence, the said plan shall have lower expense ratio. The expense ratio of the direct plan is 0.4-0.75% lower compared to regular plans. Let’s take an example of ICICI Prudential Value Discovery Fund – Growth. The expense ratio of Regular Plan in case of ICICI Prudential Value Discovery Fund Growth is 1.75%, whereas under Direct Plan expense ratio is 0.84%. Effective difference is 0.91% which seems to be very small however for the long-term this will bring huge savings and increase your returns. For example, you invest Rs. 2 lakh in ICICI Prudential Value Discovery Fund – Regular Growth and if the fund returns 12% in the year. This amount will grow to Rs.2,24000. As expense ratio of the regular fund is 1.75%, 1.75% of Rs.2,24000 (Rs. 3920)will be deducted and Rs. 2,20080 will be shown in your mutual fund statement. Effective return will be 10.04%. If you have invested the same amount in the direct fund this amount will reduce to Rs.2,22118 and effective return will be 11.06%. Over the period, this small difference leads to a big difference in growth and return of your portfolio. I hope it is clear why advisor insists on investing in Direct Mutual Funds. In order to invest in direct mutual funds, you can follow the procedure given below. (1) Visit the AMC office or appointed Register Transfer Agent (RTA) like CAMS, Karvy. Submit application form of the direct plan along with PAN copy and cheque. (2) Register online to respective AMC website and purchase the direct plan online using online payment gateway. How to switch from Regular Plan to Direct Mutual Funds? You can switch from regular plan to direct mutual funds any time. Follow process given below for switching. (1) In order to switch to Direct Mutual funds you need to submit the form for the conversion of future SIP instalments to Direct Plan. You can find this form online for all AMC’s. Sample form for ICICI AMC is given here. (2) While filing the Form you need to mention Folio Number, Scheme detail and other information carefully. (3) On submission of this Form you will get acknowledgement slip. (4) It generally takes 10-15 days for this conversion. You will able confirm this conversion once you receive your next mutual fund statement. Remember:- Approval or Permission from distributor is not required for this conversion. You will not able to convert ELSS in lock in period. Direct Plans is available for all schemes? Can I do SIP in Direct Mutual Funds? Yes, You can do SIP with Direct Mutual Funds. Where I can see NAV for Direct Plans? Fund NAV will be available on AMFI website as well as on the company’s website. Where I can find Expense Ratio of Direct Plans? You can find Expense Ratio on AMC website. Hope you find above information useful. Do share your queries in comment section I will be happy to answer that. For more information about Direct Plan refer to FAQ given on CAMS online Site. How to Switch from Regular Mutual Fund to Direct Mutual Fund? As Direct NAV is higher than Regular schemes,Units allotted in Direct scheme is less than that of Regular schemes. Then how direct investment gets better return? I feel it may be better only in NFO. You are correct up to some extent.However,In direct mutual fund charge of commission is Nil.This leads to low expense ratio and indirectly you will get higher returns. I am a beginner in MF what do i do? Dear Amit, You can start investing in Mutual fund SIP – HDFC Prudance Balance Fund or UTI Top 100 is suitable funds.